Pay Per Click also known as PPC is one of the internet advertising or digital marketing method where you pay the advertisers such as Google AdWords, Facebook Ads, Yahoo! Search Marketing or Bing (Microsoft adCenter) for each click on the ad you have placed. PPC is one of the way to give your SEO and Social Media efforts an extra kick. PPC is a form of inbound marketing, it is sustainable and it does work. So why should you go for PPC? When you have a budget for online advertisement and you want to maximize every single penny you are going to spend, PPC is one of the best choices you could have. When a PPC marketing campaign is properly optimized, it yields a rewarding ROI(Return on Investment). 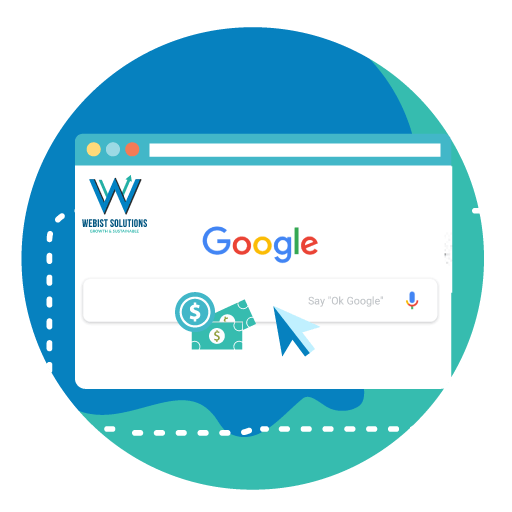 With Webist Solutions's expertise on doing PPC advertising campaign, we frequently recommend PPC as one of the marketing strategy for a new website in parallel with the long term SEO strategy because it gets immediate traffic and can help generate significant sales within weeks. Hence what we do in maintaining PPC campaign? We have professional Ad Copywriting and implementation, conduct A/B multivariate testing, review ad quality and monitor performance. We also optimize ad scheduling and bidding to get quality prospects and good CTR (click-through rate) while ensuring it’s cost effective. Lastly, we also help to develop landing pages and optimize call-to-action to increase leads conversion.